• Rates are in euros, per room per day. • Rates include VAT but not the tourist tax applied by the city. • Rates include breakfast excepted for special offers with discount. • You have the choice between 3 payments methods at different rates: booking with credit card details and no deposit, booking with payment of 1rst night and booking with full payment. However for some special bookings (groups, packages, long stays), Riad Sabah requires a mandatory deposit to secure the reservation. • Check-in time is 2 pm. If you arrive before this time you are welcome to drop your bags off at reception. Please note that our Reception normally closes at 10pm. Late check-in must be arranged in advance with our reservation manager. • Check-out time is 10 am. However, for special guests (repeat guests, "genius" guests...etc), late check-out can be arranged with the direction. • Upon reservation, credit card will NOT be charged and is required only to secure your booking. • The amount to be paid upon arrival is indicated on the booking confirmation page and email. Tourist taxes will be added to this amount. • Cash payments can be made either in euros or moroccan dirhams. We offer then a discount of 3.3% off the total price. • The Hotel accepts Visa, Mastercard, American Express, and JCB credit cards. Debit Cards are not accepted. • A 50% deposit is required for Long Stays and Early Bookings. • For Weddings, New Year and Christmas Packages, full payment is required when you make your booking. Bookings will only be accepted via the website and are unrefundable. • The hotel reserves the right to cancel reservations with declined credit cards. • A 25% deposit is required to confirm your booking. • Cancellation 1 month prior to arrival: full refund. • Cancellation less than 1 month and before 2 weeks: 50% refund. • Cancellation less than 1 week: no refund. • Cancellation of and/or amendments to your reservation must be made 72 hours prior to your arrival date. • Cancellation or amendment made within 72 hours of arrival will incur a cancellation fee of one night's room charge. • In the event of no-show or amendment made during your stay, the full amount will be charged to your credit card. • Guests are requested not to smoke at Riad Sabah, with the exception of the open parts (patio) and the roof terraces. 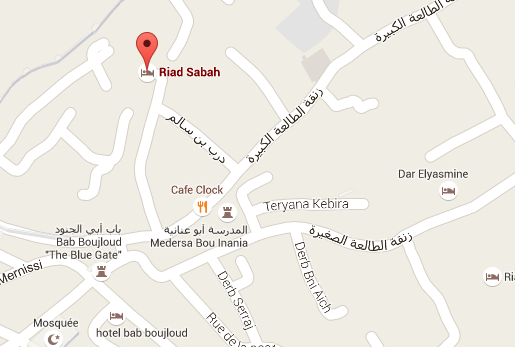 • Our riad is reserved exclusively for our guests. The staff shall be entitled to evict any additional occupants in the room. • Children under 12 years stay free when sharing a room with an adult. • Child breakfast charge is applicable for any child between 6-12 years old. Breakfast for children under 6 years is free.